Artful design and superior performance are embodied in the GBK for the ultimate bench/floor scale. The GBK can be used with or without the pillar for complete operating flexibility, and combined with a mid-sized stainless steel platform they are an exceptional value. The large backlit display with capacity tracker is easy-to-read and shows how much weighing range is left when using the tare function, ensuring that you do not overload the scale. Amber, green and red LED indicators for easy recognition of underweight, overweight and acceptable limits make check weighing applications quick and simple. Multiple LED’s for each color can be programmed to turn on together to quickly indicate over/under weights, or in sequence for a more detailed indication. A full numeric keypad allows for preset tare functions and freely selectable sample size in the counting mode. The keypad and functions can be locked out by a supervisor to prevent unauthorized tampering with scale settings. Sending information to printers and computers is easy with the bi-directional RS-232 interface with date and time, providing easy data recording and traceability to increase productivity. 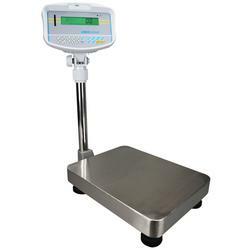 All Adam bench and floor scales offer a variety of built in weighing applications including dynamic/animal weighing, parts counting, percentage weighing, check weighing, and check counting. 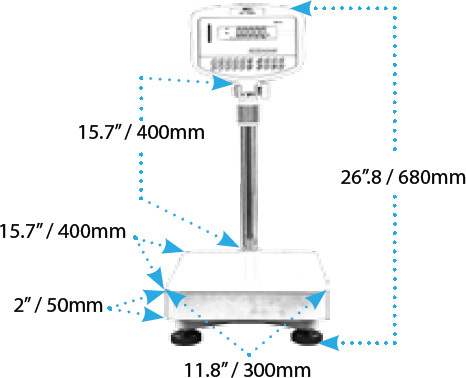 Rechargeable battery and AC operation, RS-232 interface, and automatic weight accumulation are just some of the standard features that make Adam bench and floor scales an outstanding value. Solid removable stainless steel pan makes for easy cleaning and can withstand industrial applications. Rechargeable battery means that these units can be used anywhere even in industrial warehouses where power might not be readily available. Selectable auto power off saves battery life. Large backlit LCD display with capacity tracker is easy to view and gives you everything you need in one place. Check weighing LED lights to show acceptable limits. 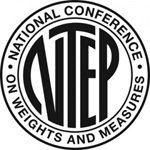 Automatic accumulation, for adding totals for every weight reading. 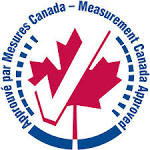 For accurate readings adjustable feet and level bubble let you level your scale for optimal performance. Adjustable pillar mounted indicator can be rotated and angled for the ideal viewing position.